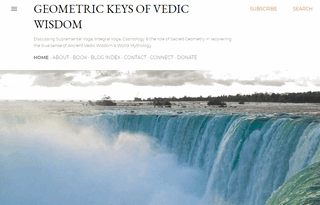 Geometric Keys of Vedic Wisdom is a blog presenting much original research and discoveries regarding the ancient myths and symbols of the Rig Veda, Indian lore, and other ancient wisdom traditions throughout the world. Ultimately this is a blog about Integral and Supramental (Purna) Yoga, founded by Sri Aurobindo, which strives to inspire readers to think and see the Whole, Unified Field of our evolutionary journey in a higher light. Subjects covered include Vedic Wisdom, Indian mythology, World mythology, Vedic Math, Sacred Geometry. Many posts are geared towards illuminating the meaning long-hidden symbols and words; others discuss the symbolism and synchronicity of past and current events, with the underlying assumption that ALL IS CONNECTED.